Following the successful completion of their final tour of 2005, the members of The Wedding Present and their crew have now all returned home for some well earned rest. David Gedge, however, will be making one final live appearance this year. He's agreed to perform a few acoustic songs at around 8 pm on Friday 16th December at Ye Olde Smugglers' Inne in the village of Alfriston, in Sussex, in support of The Chicago Dixie Jazz Band. Admission to the event is free and the splendid village shops will be open until 8pm for evening Christmas shopping. The Wedding Present's concert in Rennes on 6 November 2005 was cancelled after guitarist Simon Cleave collapsed due to exhaustion during the sound-check. Simon was admitted to hospital and kept overnight for observation but discharged the following day. Everyone was relieved to hear that nothing serious was found to be wrong and the tour will continue as scheduled. The band would like to apologise for any inconvenience caused by this cancellation. The Wedding Present, who are currently in the middle of a European tour, have regretfully announced that, due to circumstances beyond their control, their November 4th concert in Bordeaux has been cancelled. The group would also like to mention that the venue for their Leicester show on 17 November has also been changed from The University to The Charlotte. The band apologises for any inconvenience caused by these changes. As usual, the Wedding Present mail order department [aka Jessica] has ground to a halt while the band is on tour, so please expect slight delays if you have recently ordered something and not yet received it. New Wedding Present merchandise is being sold at the concerts, but this will not be available for sale by mail order until the band return from their travels and have a chance to update the web site and sort out the office! Thank you for your patience! WEDDING PRESENT BABY & CHILDREN'S SIZES ARE HERE! 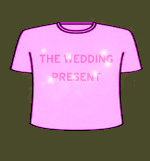 Scopitones are now offering the blue Wedding Present t-shirt (with the pale green logo) in sizes ranging from adult extra-large all the way down to toddler. And there's also a version for babies (sized 6-12 months) which comes in either royal blue with pale green logo or pink with sparkly logo. Scopitones will be releasing a new three track Wedding Present CD single [Catalogue number TONE CD 022] on 24 October 2005. Taken from "Take Fountain", the band's latest album, "Ringway To Seatac" has been a live favourite with fans and is being released by popular demand. The song is a heart-breaking two minute and forty second account of David Gedge's departure from Manchester's Ringway Airport to Seatac Airport in Seattle. It starts and ends with relentless guitars and energetic drumming but the chorus is a slow ache. This contrasts with the pretty whimsy of "Shivers", a delicate male-female vocal duet with instrumentation almost in the style of a 40s vinyl record. Recorded during the Take Fountain sessions, the song first appeared as part of a John Peel Session, transmitted on 21 September 2004. "American Tan" returns to classic Wedding Present form with driving guitars and screeching feedback, clocking in at just 1'33". The single's A-side has been chosen for Steve Lamacq's "Rebel Playlist". Listeners will be voting this week on three tracks and the winning track will be announced on Monday 3 October and then played on all 6 Music daytime shows throughout the week. Three more Spanish dates [Madrid, Valencia and Zaragoza] have been added to The Wedding Present's forthcoming European Tour. Please visit the tour page of this site for full details. The Wedding Present have now confirmed the dates of their forthcoming mini-European tour. The concerts will take place in France, Spain and Great Britain in October and November 2005. For full details, including ticket information and support groups, please visit the tour page of this site. These will be the last Wedding Present shows for this year, but the band are hoping to return to North America and Germany in 2006. Scopitones mail order merchandise department [i.e. 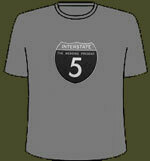 Jessica] has recently become aware that a small number of the Interstate 5 T-shirts are slightly faulty - the ink is washing out much sooner than it should. This is a problem with the printing. If yours is affected, please could you send it back to us and we'll refund the postage plus send you a new completely fault free T-shirt? We're very sorry about any inconvenience this may have caused. Any new shirts will be quality tested before being sold. Thank you very much for your patience with this issue! The Wedding Present are spending the summer touring round various festivals in Europe. They have already played at several but have yet to appear at others in Switzerland, Spain, France and Belgium as well as The Edinburgh, Leeds, and Reading Festivals and Leicester's Summer Sundae Festival here in the United Kingdom. British fans might also like to know that the group is also playing one-off shows in Wrexham and Southend in August. For full details please visit the tour page of this site. Meanwhile, a short tour with a completely new set is currently being planned to start at the end of October to coincide with the release of a new single, RINGWAY TO SEATAC, to be taken off the band's recent album TAKE FOUNTAIN. Most of the dates are now confirmed and as soon as we have a complete list we will be sending out another email newsletter and adding the dates to the tour page. This tour begins with David DJ-ing once more at 'How Does It Feel?' in London on 21 October and terminates with the whole band playing at The Shepherd Bush Empire in London on 20 November [ticket link below]. This will be The Wedding Present's final concert of 2005. We'd like to draw your attention to a couple of publications. Firstly, David Gedge is in the August issue of 'Record Collector', out now, discussing his record collection. And, secondly, Cinerama, The Wedding Present and David Gedge all feature heavily in a recent book called The Festive Fifty, written by Mark Whitby. This book [ISBN 0-9548317-0-5] is published by Nevin Publishing [Post Office Box 194, Widnes WA8 7WU]. The book contains a complete history of the Festive Fifty, with commentary on each year and entries of particular interest. "Lovingly crafted by avid John Peel listener and Festive Fifty obsessive Mark Whitby, 'The Festive Fifty' contains more information than even the most seasoned Peel listener could shake a stick at. The result of twenty years' research, the book tells the story of the most intriguing and fascinating chart in radio history, including extended commentaries on many of the bands and records that have appeared during its 28 year history." We are sorry to announce that the date of The Wedding Present's appearance at the Dour festival in Belgium has been changed to July 17 and would like to apologise for any inconvenience this might have caused. On a more positive note, a couple of concert dates have been added to the band's summer series of shows... in Lausanne in Switzerland and Wrexham in Wales, details can be found on the Tour page. 'Take Fountain', the new album from The Wedding Present is now available to purchase from this web site. Please visit the merchandise page for full details. Following their forthcoming North American tour, The Wedding Present will be returning to Europe to play a one off concert in Athens and then festivals in Barcelona and Berlin. Please visit the tour dates section of this site for more details. Fabchannel.com will be webcasting The Wedding Present's Amsterdam concert on April 4th. The link to The Wedding Present page on Fabchannel.com is http://www.theweddingpresent.fabchannel.com and the webcast starts at: 22:00 CET. The Wedding Present have been busying themselves at British radio stations. As well as recording sessions for Gideon Coe and Tom Robinson at BBC 6 Music and John Kennedy at XFM, you can hear David playing a couple of acoustic songs on Claire Kember's show on Brighton's Juice 107.2 on Sunday 13 February from 8PM and www.totallywired.co.uk from the following Monday afternoon. Pete Mitchell will also feature live acoustic songs on his Razorcuts Wedding Present Special show on Sunday 27 February from 8PM on Virgin Radio [105.8 FM in London & The South East, 1215 AM nationwide, and www.virginradio.co.uk]. The band will hopefully also be recording sessions for BFBS, CRMK and Vic Galloway at BBC Radio Scotland in the near future. The Wedding Present release TAKE FOUNTAIN, their first album for over eight years, in February. Scopitones will release the eleven track CD [the full track listing of which is: On Ramp, Interstate 5 [Extended Version], Always The Quiet One, I'm From Further North Than You, Mars Sparkles Down On Me, Ringway To SeaTac, Don't Touch That Dial [Pacific Northwest Version], It's For You, Larry's, Queen Anne and Perfect Blue] in the United Kingdom on St. Valentine's Day, 14 February 2005. The album will be simultaneously released by Stickman Records [ www.stickman-records.de ] in Germany, Austria, Switzerland, Italy, Belgium, Luxembourg, The Netherlands, Israel, Australia and Scandinavia. On 15 February, the album will be released in France, Greece, South Africa, Taiwan and Korea by Talitres [ www.talitres.com ] and in the United States of America and Canada by Manifesto [ www.manifesto.com ]. The North American version includes the promotional videos for 'Interstate 5' and 'I'm From Further North Than You' which are also featured on the band's new DVD single. All the songs were written by David Gedge and Simon Cleave and recorded in Seattle by Steve Fisk, who also produced The Wedding Present's Watusi album a decade ago. TAKE FOUNTAIN is a body of songs so heartfelt that it's impossible not to be moved by them and an album that is the equal, if not surpassing, anything Gedge has previously recorded and released. To celebrate the album release, the band will be recording various sessions in the UK for The Hub [BBC 6 Music], Razorcuts [Virgin Radio], John Kennedy [XFM], Vic Galloway [BBC Radio Scotland] and Claire Kember [Brighton's Juice 107.2] amongst others. David will also be a guest on Round Table [BBC 6 Music] on Friday 11 February. The band's booking agent is currently putting the finishing touches to The Wedding Present's first tour of North America since 1996 and this five week jaunt will commence on 14 April 2005. Meanwhile, there have been changes to the British and Continental European dates that have already been announced. Some venues have already sold out, some venues have been changed, and new dates are being added. Please keep an eye on the tour page for all the up to date changes. David, Simon and Terry regret to announce that Cinerama drummer Kari Paavola will not be joining them on the forthcoming Wedding Present tours of Europe and North America. The concerts begin in the middle of February and last until the end of May and Kari was not able to commit himself to such a long stint, due to other obligations. Kari appeared 137 times as the Cinerama drummer, from Glasgow in October 2000 to London in April 2004 and played with the band in the USA, Canada, Spain, Ireland, Turkey, Germany and The Netherlands as well as The United Kingdom. Due to circumstances beyond the control of The Wedding Present, the date of the Lausanne show has reverted back to Monday 21 March. Please check the Tours page for details. Apologies again. The Wedding Present have a new single: I'M FROM FURTHER NORTH THAN YOU out on Monday 31 January 2005. Scopitones will release the single in the United Kingdom as a three track CD, a three track DVD and a two track 7". CD - I'm From Further North Than You / Rekindling / The Girl With The Curious Smile. DVD - I'm From Further North Than You [Promo Video] / Interstate 5 [Promo Video] / Perfect Blue [3 Minute Film]. 7" - I'm From Further North Than You [Klee Remix] / Nickels And Dimes. I'M FROM FURTHER NORTH THAN YOU is classic Wedding Present... from its over-wordy title with a hint of a North-South Divide to the sad story of the end of a relationship between unhappy people. More surprising though - to the dissenters at least - is that it's better than anything The Wedding Present ever released in their previous incarnation. This is because David Gedge has spent the eight years since the last Wedding Present releases writing, recording and singing beautiful string-laded lush pop music with his Cinerama project - and has brought his experiences from this to bear on the new Wedding Present recordings, proving himself, if there was still any doubt, to be one of the best songwriters in Britain today. I'M FROM FURTHER NORTH THAN YOU is perfect guitar pop with a twist, grown-up without ever straying towards the embarrassing territory of "mature" - "I admit we had some memorable days... but just not very many" runs the refrain. It is released on three formats - a 3 track CD single, a 7" featuring a gentler remix by Klee [the disco group from Germany whose song 'Erinner Dich' was covered by Cinerama on their last single] where the touch of female vocal on the original is brought to the fore, and a DVD. The DVD includes a charming video for I'M FROM FURTHER NORTH THAN YOU featuring David and a mystery girl pacing the streets of Edinburgh talking lyrics from past Gedge songs into their mobiles, and an eerie video for the rougher, edgier, last single, INTERSTATE 5. PERFECT BLUE [3 MINUTE FILM] was shot in Amsterdam at a semi-acoustic performance by David Gedge and [Wedding Present guitarist] Simon Cleave and also includes footage taken by David himself. The videos on the DVD single were all made by Tim Middlewick, who directed 'Get Up And Go', the acclaimed Cinerama DVD. Please note that the single will not be available for purchase by mail order until Monday 14 February 2004. Finally, David, Simon, Kari and Terry have now achieved the distinction of being in the late John Peel's Festive Fifty in two different bands, with INTERSTATE 5 by The Wedding Present and IT'S NOT YOU, ITS ME by Cinerama, and would like to sincerely thank everybody who took the time to vote for them. On Wednesday 2 February 2005, David and Simon from The Wedding Present will be appearing on the Dutch TV show "3 voor 12". They will have 25 minutes' time for an interview and 5 acoustic songs. The show starts at 10:00 pm.